The PlayTin Casino, found at the URL Playt.in, is an HTML 5 Bitcoin casino that was first introduced to the Bitcoin game community on March 3rd, 2013. It’s simple design lacks any sort of complexity that players used to high-end graphics are used to, but it’s game play can be used across any platform, for the most part. PlayTin features nine different games for players to play, although some of them are played in a different fashion than what is most commonly featured at a majority of places. PlayTin also has investment program that seems to be automated, for investors and players to buy shares of PlayTin. Since July 2014 though, PlayTin has not been active within the Bitcoin community as far as it’s communication within the community and has recently been deemed, at best, a questionable place to wager Bitcoin at. 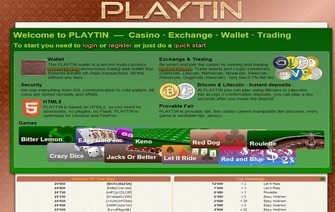 “PLAYTIN is a provably fair Bitcoin/Litecoin casino. The outcome of each game is determined by a server secret and a player provided client secret. This ensures that we cannot predict or change the outcome of any single game. After each game play, all this data is revealed and can be verified. PLAYTIN leverages the capabilities of modern HTML5 browsers. There is no longer a need to download anything or install closed source software or even use exploit-loaded flash technology. We focused on having a friendly and slick user interface, so that players can feel right at home. The games offered at PlayTin are Roulette, a variation of dice called Crazy Dice, Keno, Video Poker, and two games that are exclusive to PlayTin: Red and Blue and Bitter Lemon, which are each basically games of a coin-flip’s chance. As mentioned prior, the game play is played using HTML5 as its source as PlayTin’s gaming software. This enables players to use virtually any platform or device to wager on any of the nine games that PlayTin offers. Aside from the HTML5 aspect, the games run smoothly and have consistent payouts that are within the same range that other Bitcoin casinos have, including games that are up to 99.8% in payouts, leaving only a .2% house advantage. PlayTin uses the “provably fair” verification that almost every casino using HTML5 offers, that provide player the added security of being able to verify each wager placed, within every game. Although PlayTin does not provide the amount of games that most other casinos are able to provide, being able to provide this kind of verification along with the popularity of the games they do provide, tends to cancel out any player complaints concerning the amount of games provided. Players and investors alike, are able to participate in the purchase of shares at PlayTin and receive a Bitcoin payment, depending on the number of shares that they currently hold and the amount of dividend that is due to be paid out, for each share. Share payments are automatically paid, each month, to the Bitcoin address that is provided by the player or investor. Share payments are made after total site revenue has been completed minus the costs that shareholders are responsible for in maintaining the site’s maintenance, hosting, and other related costs. As mentioned throughout the review, PlayTin provides the “provably fair” verification for its games as has been common throughout the industry, when dealing with casinos that exclusively use HTML5 as their main code within the setup of the site. The most concerning factor when it comes to PlayTin is the unfortunate fact, that support seems to be disengaged completely to any type of requests, and appears as if the owner has set the whole site to “automatic”. Although an email address can be found for creating a support ticket, no responses have been received since around, July 2014, although the site itself along with payouts, for the time being, are seemingly going through. The oddity behind this is certainly questionable for any new player that might be interested in wagering at PlayTin. It is worth a note of caution that due to the lack of support, that players be cautious when proceeding to wager at PlayTin. Usually a lack of support, by all indications, is the imminent sign of a future site closure. As PlayTin seems to still be running smoothly as a casino, the biggest concerns are quite glaring in their demeanor. While shareholders and players seem to still have access to being able to withdraw their funds from both the casino, and receiving payouts through shares of their ownership of PlayTin, the lack of support is an unexpected part of this. Players who are wanting to either invest or wager at PlayTin are cautioned that due to a lack of support response by any party that is associated with PlayTin, that it might be a sign of its future closure and a player’s unfortunate loss of their funds.